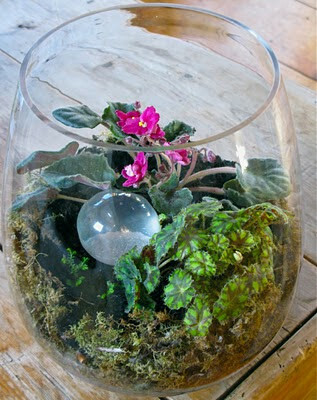 Beautiful begonia and african violet terrarium by Michaela at thegardenerseden.com. See full post for a how-to guide and some other lovely terrariums! That is so beautiful. I made one very similar to that for a friend! Good to hear! I really want to try my hand at putting violets in a terrarium. I keep talking about it - I just need to make myself pick out a plant. They really do quite well, which has always boggled me because the leaves aren't supposed to like water? But they do great?